This is one of those topics that can be a bit touchy for some, but certainly one we want to talk about. It is touchy for some, because some program providers have never been asked whether they know what movements are safe for mom and baby nor do they pay attention to the participants in class to see what movements should be avoided. There are example upon example of YouTube videos of mom and baby classes (knock off programs of larger programs) where you can see moms being asked to do movements that are not safe for their post-partum bodies, but mostly of babies being twisted, whipped, shaken and jostled around. THIS is why we want to have the conversation. 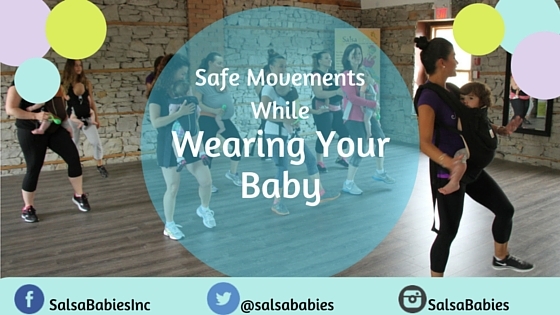 Salsa Babies makes it a top priority to ensure the safety of both moms and babies, but many do not. It’s time we all let them know it matters! Moving/dancing/stretching with your baby is a great way to be active and bond with your baby at the same time. But that doesn’t mean that every movement you do while not baby-wearing should be done while babywearing. You should never be asked to do any type of movement where both of your feet leave the ground (i.e jumping). There should never be any quick turns or spins in the class. Rapid movements of any kinds should be avoided because it is unsafe for your baby. Your baby does not have the ability to predict your movements and therefore any quick movement will leave them jarred. If you ever see your baby’s head and neck moving around, bobbing or bouncing your movement should immediately be toned down or stopped. If it hurts – STOP!!! During pregnancy and after pregnancy your body is much more loose and flexible thanks to the Relaxin floating around. Because of this it is easy to over-stretch or over-do it. It is important after all activities to ensure you bring your heart rate down and do some stretches. This is the best way to help your body after a workout. The last thing to consider is that not all programs are created equal. Many people look at programs like Fit 4 Two, Salsa Babies, Fitmom, Bellies Inc etc and think ” I can do that myself, I don’t’ need their training program”. Many people then proceed to start up their own versions of fantastic well-rounded programs, without any thought to safety. What these people fail to realize is that it isn’t just as simple as putting some moves/stretches/exercises together and calling it a class! If it was, we would all be out of business! When choosing a great baby wearing class, look into the instructors training. Do they have a degree or Certification behind them? Are they an instructor from a larger organization? This doesn’t always mean there won’t be an issue, but it sure is better than someone with no training who is trying to ‘knock off’ a great program!